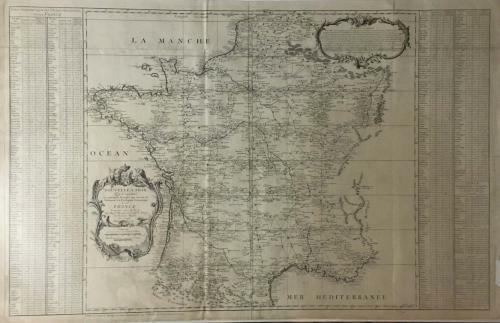 This geometrical map of France was published by Cassini with the support of the Académie des Sciences, shows the main network of triangles built from the meridian of Paris, along the coasts of the ocean, and on the borders. This triangulation network was made to accurately measure length and width of France, including the distances of notable objects and landmarks. Having been started by Giovanni Cassini in the 1670’s, this particular map is the product of three generations of work by the Cassini family and is considered the first published map of a country using modern mapping methods. Condition: Very good with narrow margins and minor age toning. Creased where folded into a book, with a few splits along the creases (no loss). Some of the creases and splits and were previously reinforced on back using archival tape. Missing paper in the right margin, and some splits along the edges.